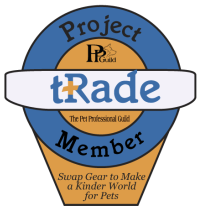 By participating in “Project Trade” you can earn a discount* off our services simply by giving us your choke, prong, or shock collars, or any other qualifying pet gear you have laying around. It couldn’t be easier! Effective, humane animal training and pet care methods are the foundation of any animal’s healthy socialization and training and help prevent behavior problems. Since a wide variety of equipment and tools are commonly used when training pets, the pet-owning public needs to be aware of the potential problems and dangers some equipment may pose. Click here to read why the use of collars and leads that are intended to apply constriction, pressure, pain or force around a dog’s neck (such as ‘choke chains’ and ‘prong collars’) should be avoided. Distinguished veterinarians and behaviorists worldwide are joining the discussion and calling for the elimination of such devices from the training efforts of both pet owners and professionals. PPG thus encourages all pet owners and pet professionals to embrace modern, scientifically based training techniques and tools, especially the latest generation of no-pull harnesses which are free of the risks posed by traditional collars and offer far more benefits. So swap your gear and help create a kinder world for you and your pet! To learn more visit PetProfessionalGuild.com or contact us. *Not to be combined with other discount offers. "There is no way I would be touching a wolf, fox or coyote using the methods I learned back in the 60s and early 70s because if I did, I'd either be dead or they wouldn't come near me. ​Dogs and horses are about the only animals that you can punish who will forgive you for it so they seem to take the brunt of it and that's a shame. Just because you can do it doesn't make it right."